Before there was Atlanta’s High Museum of Art there was Villa Clare-J.J. Haverty’s Mediterranean style home on Peachtree Street. During the heyday of Villa Clare in the 1920s and 1930s (the Shepherd Spinal Clinic is located there today), Haverty regularly opened the doors on Sunday afternoons to invite the public to enjoy his collection of more than 100 museum-quality paintings and sculptures by mostly American artists including Childe Hassam, William Merritt Chase, Helen Maria Turner and Henry O. Tanner, a renowned African-American painter who lived in exile in France. Haverty’s open house tradition was just part of the self-taught collector's bold plan to establish Atlanta as an artistic and cultural destination. And his efforts proved remarkably successful. As a way to build momentum for the arts in a city traditionally preoccupied with commercial progress, Haverty in 1924 and 1925 teamed up with the Grand Central Galleries in New York to organize exhibitions at Atlanta’s Biltmore Hotel. These events not only attracted huge crowds, but they raised public awareness about Atlanta’s lack of a permanent museum. In 1926, Mrs. J.M. High agreed to donate her home as Atlanta's first museum, and later much of the Villa Clare collection was donated to the fledgling High Museum of Art. A devoutly religious man who never graduated high school, Haverty left a legacy far beyond the arts. In addition to founding the Haverty Furniture Co. in 1885, he was involved in the ill-fated project to carve a Confederate memorial on Stone Mountain. He also helped to build the Cathedral of Christ the King in Buckhead. As a young man, he was a first hand witness to pivotal events in Atlanta history, including priest Thomas O’Reilly’s heroic efforts to save the city’s downtown churches (Haverty served as his alter boy). 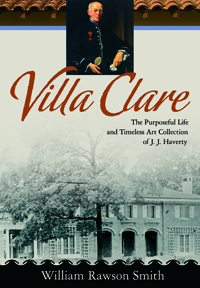 In telling the previously unpublished story of J.J. Haverty and his art collection, Villa Clare provides a unique new perspective on the story of early Atlanta.